On one side was a former K1 champion and legend of combat sports who was entering the octagon in the UFC for only the second time in his long and storied career. He was Mirko Filipovic, better known as Cro Cop, and he was expected to enter the UFC and march towards another title. On the other side was a young Brazilian who was entering his fourth UFC fight but only 9th fight ever as he approached the biggest fight of his career. His name was Gabriel Gonzaga and he was expected to put up a good fight but ultimately lose to the legend. Heading into the fight it was all about the reputation of Cro Cop and his ability as a fighter that was going to take over the UFC. His experience and kickboxing ability made him one of the more exciting fighters in the UFC. He had proven that in his first fight in the UFC when he finished Eddie Sanchez in the first round with a TKO win. That fight had shown the ability of the Croatian fighter and for those who knew about him beforehand it proved what they had known for so long, Cro Cop was a finisher. Heading into his second UFC fight everyone wanted to see more especially since he had used his ground fame to finish the fight and not his devastating kicks that he had been known for in his career. Then there was Gonzaga who really wasn’t expected to do a lot but had put together an impressive UFC run. With three straight wins since he entered the UFC he had been proving to be a true contender especially since all were early ends to the fights. With his run up the heavyweight division he was given a chance against a fighter that had far more experience and was considered one of the scariest strikers in the sport. The fight between Cro Cop and Gonzaga had both fighters on the edge of the title with their main event the top contender fight for Randy Couture’s heavyweight title. There was plenty on the line and for the most part people had looked past Gonzaga, giving Cro Cop the title shot before the fight. Then the fight began and for both fighters the world changed in one of the most devastating finishes in UFC history. The fight saw Gonzaga prove that he truly did belong in the octagon with the legendary kickboxer as he came out strong. Eventually the fight went to the ground where Gonzaga took top position and began unloading on the Croatian. The fight was eventually brought to the feet and both fighters went back to exchanging until the moment that many UFC fans remember all too well. After all of the talk about Cro Cop’s great kicks it was Gonzaga that showed off his kicking ability reaching up and nailing Cro Cop in the head. The Croatian was out instantly and as he went down his leg bent behind him in an unnatural position. It is one of the greatest knockouts in UFC history and since then both fighters have been defined by that one second. For Gonzaga the win brought him to the heavyweight title fight, where he lost, and since has remained in the UFC in an up and down career. For Cro Cop the loss led to his route out of the UFC as he took a second loss in a row to Cheick Kongo and moved on to Dream. Gonzaga has remained in the UFC largely because of that huge knockout win while Cro Cop has never been the same fighter he once was since he was knocked out. Now both fighters will meet once again, eight years after that day where both of their careers were defined. It is clear that both fighters enter this fight at different points than they were in 2007 as neither re close to a title fight. 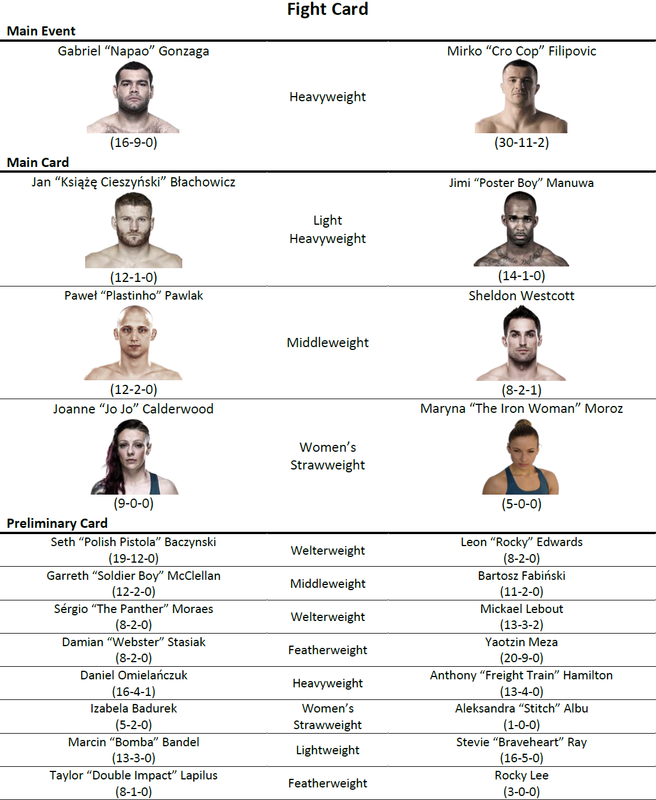 After remaining in the UFC Gonzaga has not been able to recapture the magic of that night and now comes into another main event on a two fight losing streak. He is simply looking to jumpstart his career in the UFC and try to find his way back into the title conversation after falling to #14 in the heavyweight division. Cro Cop has a different mission in mind as he returned to the UFC in 2009 but more losses began to pile up and he left for Japan. After winning the heavyweight title in IGF and defending that belt, Cro Cop is ready for another chance in the UFC. In his mind there is no better way to do that than to face the man who gave him his definitive moment in the UFC, one that has been all negative for Cro Cop. If Cro Cop can get the win he will avenge his worst defeat of his long career and will at least partly erase the memory of that devastating knockout. It has been eight years since these two first faced off and both fighters are not the same fighters they used to be in 2007. They are both still great strikers but neither will likely be as aggressive as they once were with losses piling up and forcing them to adjust. Both are older as well and their time left in the sport is shrinking as the years move on. That won’t change the fact that both of these fighters realize what this fight means after the first one changed so much for both of them. It could provide that extra boost they need to put on another classic and there is no question that Cro Cop is looking for a finish as soon as he can get one. He still has those devastating kicks that can chop fighters down and a decent ground game that can finish a fight on the ground. Gonzaga is also still a well-rounded fighter that has the BJJ background but hard hands that can knockout a fighter in one punch. 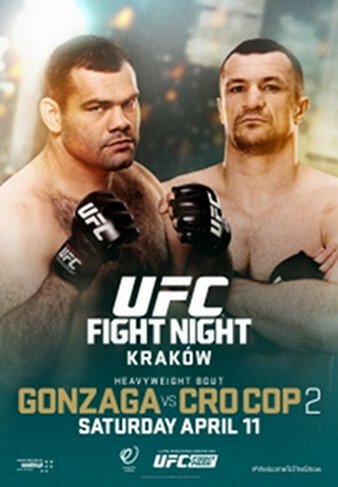 If Cro Cop wants his revenge he will try to keep the fight standing and earn the knockout while Gonzaga may believe that he can still beat Cro Cop on the feet. If that is the case get ready for a great fight between two very motivated fighters that will look to match the excitement of the first fight between them. It may not quite get there but there will still be a finish and it will be Cro Cop getting his revenge with a TKO win in the second round, gaining a little something back from their first meeting.